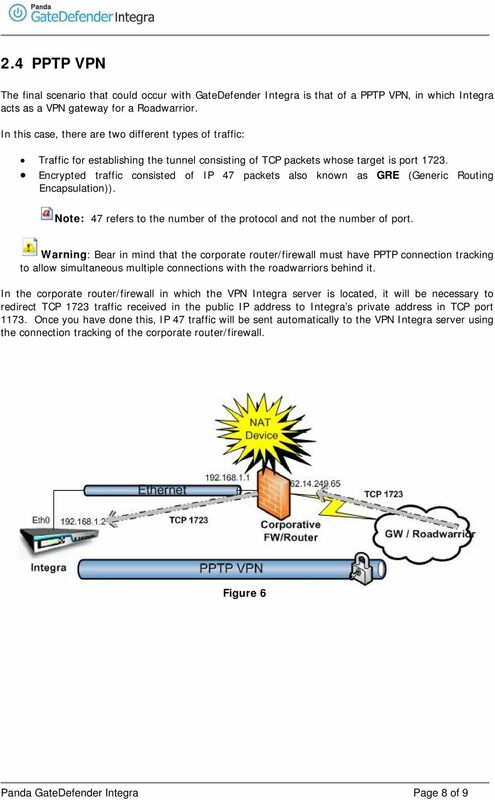 Download "Howto: How to configure static port mapping in the corporate router/firewall for Panda GateDefender Integra VPN networks"
1 Howto: How to configure static port mapping in the corporate router/firewall for Panda GateDefender Integra VPN networks How-to guides for configuring VPNs with GateDefender Integra Panda Security wants to ensure you get the most out of GateDefender Integra. For this reason, we offer you all the information you need about the characteristics and configuration of the product. Refer to and for more information. 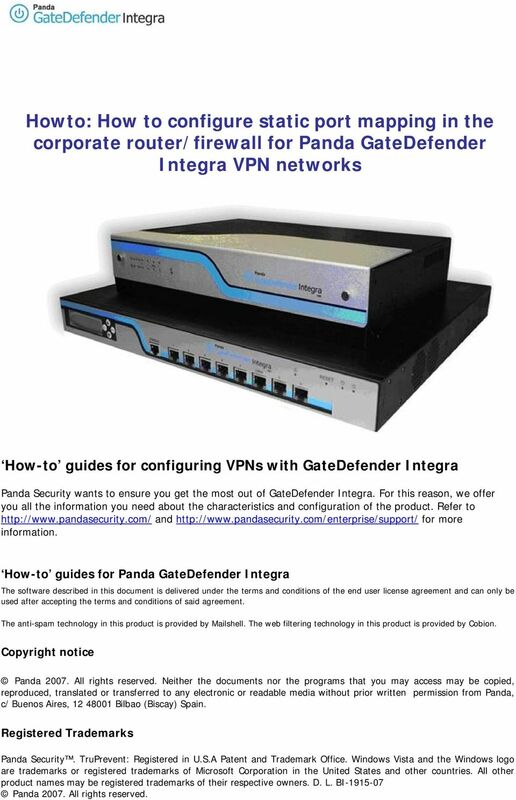 How-to guides for Panda GateDefender Integra The software described in this document is delivered under the terms and conditions of the end user license agreement and can only be used after accepting the terms and conditions of said agreement. The anti-spam technology in this product is provided by Mailshell. The web filtering technology in this product is provided by Cobion. Copyright notice Panda All rights reserved. Neither the documents nor the programs that you may access may be copied, reproduced, translated or transferred to any electronic or readable media without prior written permission from Panda, c/ Buenos Aires, Bilbao (Biscay) Spain. 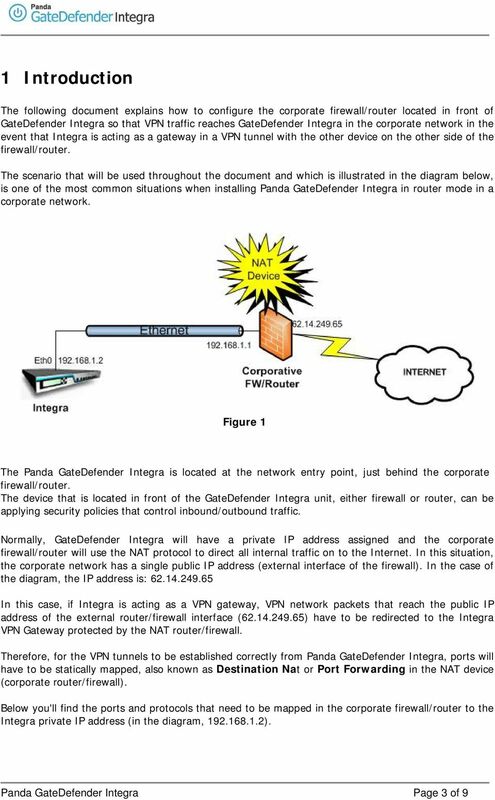 Registered Trademarks Panda Security. TruPrevent: Registered in U.S.A Patent and Trademark Office. Windows Vista and the Windows logo are trademarks or registered trademarks of Microsoft Corporation in the United States and other countries. All other product names may be registered trademarks of their respective owners. D. L. BI Panda All rights reserved. HOWTO: How to manage X509 certificates with XCA for their correct implementation in Panda GateDefender Integra. This chapter describes how to set up and manage VPN service in Mac OS X Server. 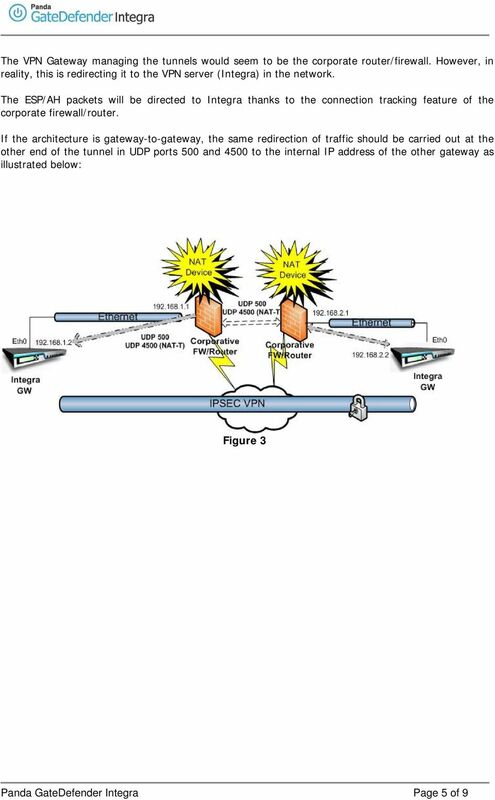 Controlling Ashly Products From a Remote PC Location Introduction Ashly networked products can be accessed from a remote PC on a different network if the router used for the Ashly device is properly configured. Securing Modern Substations With an Open Standard Network Security Solution. Kevin Leech Schweitzer Engineering Laboratories, Inc. 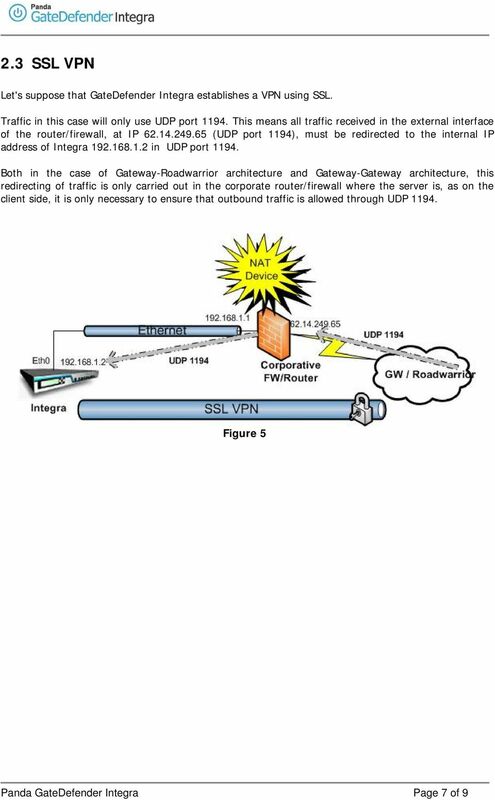 Deploying SSTP using OTP Version TBD How-To Guide June 2011 Copyright 2010 SafeNet, Inc. All rights reserved. All attempts have been made to make the information in this document complete and accurate. 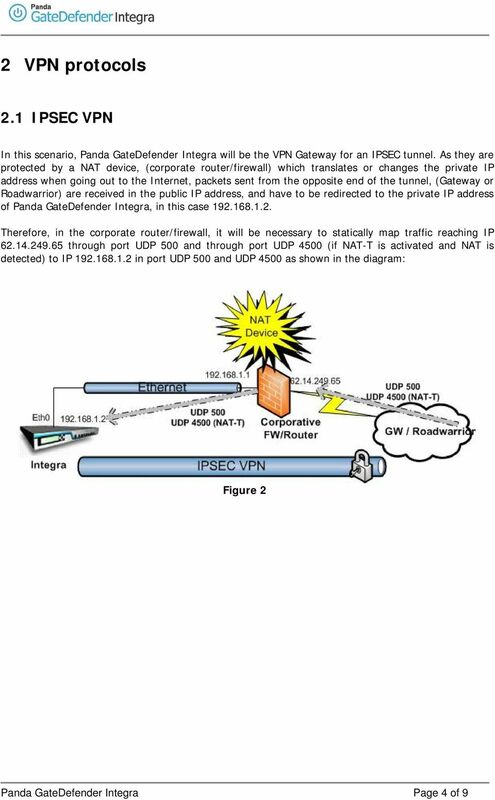 Configuring IPSec VPN Tunnel between NetScreen Remote Client and RN300 This example explains how to configure pre-shared key based simple IPSec tunnel between NetScreen Remote Client and RN300 VPN Gateway.